Weaknesses. We all have them in our table tennis game. Some players have major weaknesses (e.g. they always lose a point when attempting to play a certain shot). Other players have relative weaknesses (e.g. their backhand side is decent, but weaker relative to the strength of their forehand side). Every single table tennis player – even the no.1 player in the world – has a weakness of some sort. So how do you go about fixing a weakness? What steps do you need to take? In this blog post I explain a process you can go through to turn your weakness into a strength. The first step is acknowledge that there is a part of your game which is limiting your progress. This really could be anything – service, return of serves, pushing, topspins, tactics, footwork, controlling nerves. Take an analytic approach to your recent matches. How did you lose points? Can you see a pattern? Is there something you can improve which would add 2, 3 or 4 extra points to every game or every match you play? For my game, my backhand drive was always biggest weakness. In warm-ups I could barely hit 2 or 3 backhands cross-court before hitting the ball into the net or off the end of the table. In matches I would leak points anytime a topspin ball came anywhere near my backhand. I knew I had to something about it. There are usually multiple ways of playing any stroke. So, let’s say your weakness is your forehand topspin. If you line up 10 coaches, we will all probably tell you to do a forehand topspin in a slightly different way. Which way is right? Well, we’re probably all right in our own way. So the challenge for you is to find an approach which makes sense for your game. Observe other players at your club who can perform the shot well. Who do you want to play like? Who has a playing style, which will be easy for you to copy? This may not even be the best player in the club. There’s no point trying to copy Ma Long’s strokes, if your playing style is very different, you’re carrying too much weight and you’re way past your fitness prime! For my big weakness – my backhand drive – I started to copy a player in the division above me who had a solid (not spectacular) and very consistent backhand drive. It seemed an efficient and easy stroke to copy, which would suit my style of play. The next step is ask an advanced player or coach to help you. It can be quite hard to analyse your own technique. Some feedback from another player or coach will make you more aware of where you are going wrong. You could also film yourself, so you get the visual feedback of what your stroke looks like. An advanced player or coach will be able to tell you how to change the stroke to make it stronger and more consistent. They will also be able to suggest drills to help you develop the stroke. Approach someone whose advice you trust and can give tips relevant to your standard of play. For me, I got some help from a local coach who happens to have very good backhand technique. I explained what I wanted – to progress from a non-existent backhand drive to something which I had confidence to use in matches. So he kept things quite simple for me – just explaining the mechanics of the stroke, the timing, the contact on the bat, the follow through and we worked on this until I started achieving some sort of consistency. The next step is lots and lots of practice. You should start with regular drills, where you know where the ball is going. And start at a slower pace. It’s easier to change technique this way, as you have more control over the mechanics of your arm, wrist and hand. When you start to achieve good consistency, start gradually increasing the speed or spin of the shot. When regular drills become easy, you should move on to irregular drills, where you don’t know where the balls are going. This is harder and you may make more mistakes again. But irregular drills are essential, as they more accurately replicate the randomness of match-play. So even if you find these hard, keep persevering. You will need to do a lot of practice, until your new improved shot becomes automatic. If you stop practising the shot too early, you will most likely revert to your previous technique which is established in your muscle memory and you won’t improve. So even when you think you have improved – still keep practising again and again an again until the new muscle memory is formed. For me, I have been practising my backhand drive for the past 10 years! Even after all this time, I can occasionally slip back to my old habit of reaching forwards for the ball. This is the damned nuisance of muscle memory! But I am much more aware of when I slip back to my old habit and can correct it quickly. I still actively practice my backhand drive to keep it consistent. When you first use your new technique in a match situation, it’s quite possible that you will make mistakes to begin with. There could be a mixture of tension and crossed-wires in your brain which results in you messing up the shot. DO NOT BE PUT OFF BY THIS. It is very normal. Some players will give up at this point and go back to their previous weak technique, even if this means they still lose the point. You need to preserve. Take a longer term view. Be happy to mess up initially. But be aware of what you did wrong and how you need to correct it. Visualise yourself playing the stroke how you are able to do it in practice sessions. Even shadow play the stroke between points to remind your brain of how the shot should be played. Over time the shot will start working. For my backhand drive, I really forced myself to use in matches. I had to tell myself to stop trying to win and just focus instead on playing some decent backhand drives during a game. I would judge my performance, not by the result, but by how well I had used my backhand drive. But of course, by trying to overcome a major weakness – and focusing on that – I usually performed better and won more matches. How long does it take to improve a weakness? It can take a long time to improve a weakness, so be prepared for this. For me, it took 3 or 4 years to really admit I had a problem. I would practice my backhand drive a little bit, but would soon focus on other things, so my backhand drive didn’t really improve. Then I decided I had to do something about it and with some focused training, I was able to develop my non-existent backhand drive into something which was usable (although not particular dangerous) in 1-2 years. It stopped being a major weakness and I had turned it into a minor weakness. So I was losing less direct points on my backhand side. It then took another 2 years to turn my backhand drive from a minor weakness into a relative weakness. My backhand drive was becoming decent and winning me some points, but was weaker compared to my stronger forehand drive and topspin. It then took another 2 years for my backhand drive to become a strong shot, which was capable of winning matches for me against some opponents. So, it has taken me a long time. And it doesn’t stop there. I need to develop this shot into a major strength and also start working more on playing with more topspin. This will probably take me another 10 years! It may not take you this long. A lot depends on how bad the weakness is at the moment, how much time you have available to train and what your end goal is. I have seen other players transform a weakness into a strength in a much shorter period of time. So think about your game. What weakness do you want to improve? What do you want the shot to look like? How are you going to improve it? See if you can answer these questions and then get to work! Sign up for my popular table tennis newsletter and I’ll send you table tennis tips, tactics and training drills to help you improve and win more points. I’m a table tennis coach based in Cambridge in the UK. I have 70+ free table tennis lessons on my popular YouTube channel. I also have 150+ coaching articles to help you improve your table tennis skills. You can read more about my background on my About Tom page. Similar to you I had a very weak BH but after coaching etc I have now turned it into a strength . I’m now having the same issues with looping backspin on my FH. I can do it in practice but trying to implement it in a league match is proving difficult . My team mates are saying I should push to not lose the point with a mistake. I play lower league and this seems to be the main tactic. I’m trying to stay focused on improving my technique and thinking long term but it can be hard when your losing matches ! Yes, you have to be a little bit selfish about this. I coach a player in a similar position to you. He is trying to develop a strong FH topspin, but it’s not quite there yet. His team-mate tells him to push, as it’s a safer option. But this bit of advice, which translates as “you’re no good at FH topspin” destroys the fragile confidence this player has. So it never improves. So you have to keep persevering with it, even if you make mistakes. This is how you learn to play the shot. It’s only local league table tennis after all. Doesn’t matter if you win or lose at the moment. If you get good at this shot, you’ll be winning lots more matches and moving up divisions. Thanks Tom for your advice. I know exactly what your pupil is going through !. Hi Tom, it’s very helpfull article which increase my patience :-). I’m playing table tennis as amateur from more than 15 years and last months decided to learn with coach and robot (I’ve bought donic robo 2055 as You recommended). After few trainings I saw that however I played a lot I really don’t do it in proper way. Now I am learning rechnique with coach and later training with robot. As during this training sessions I see that I can do strokes in proper way it really does not work during matches, which is very frustrating (but I see it’s normal). – as I also learn footwork (which is very bad) can You please advice if I should learn regular drills when I know where ball is going (but then I stay in one place…) or random placed balls? With which % of consistency I can think to train with random placed ball? Do You have some advice how to train with robot to do it proper way? Hi Michal… robots are great for practising footwork. If your footwork is not great to begin with, definitely focus on regular drills with your robot. When this becomes easier, then start doing irregular drills. The great thing about a robot, especial Robo-Pong 2050/5 is that you can set it to random mode, but make the feed slow. This gives you more time to move into the right place with good footwork. Again, as this becomes easier you can increase the speed of the random balls. So in short, start with regular drills at a slow pace, then gradually speed up. Then progress to irregular drills. How long does it take to get really good at table tennis? 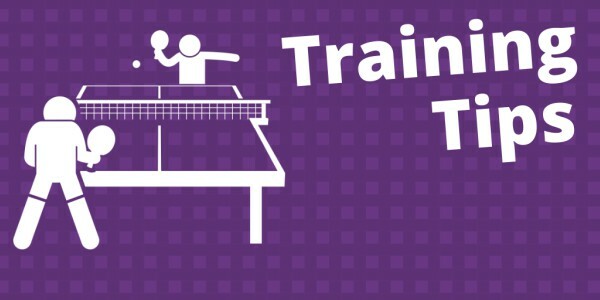 Watch my table tennis lessons (for free!) on my popular YouTube channel.